Banking is under threat. Despite access to fast-paced technology known as fintech, an antiquated business model and internal organisational paralysis do not allow for the creation of a truly beloved brand and are stifling change. To survive and thrive when their competition is catching up, banks must understand the principles behind Emotional Banking – a cultural change concept that brings the consumer to the center of rethinking banking products and delivery. 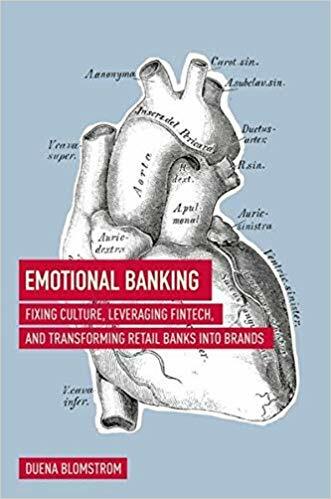 “Emotional Banking: Fixing Culture, Leveraging FinTech, and Transforming Retail Banks into Brands” starts with a history of the space then moves into an overview of what fintech is. After discussing the state of banking today including stories from the biggest names in the industry, the concept of Emotional Banking and Brand are introduced as an answer to the problems outlined above. It concludes with examples of best practices and a hands-on approach on how to change the inertia, become a brand and make customers fall in love with their bank. How many banks will survive? Can banks become beloved brands and find their way to the consumer’s heart? Why is there a disconnect between what we say and what we do in the industry? Is inertia in banking a result of broken internal culture? Which big brand or challenger will be at the top in five years?